Thank you once again for helping us raise 4,792,680 baht, or 94.4 %, of the net, which was distributed to children’s charities mostly on the Eastern Seaboard. With your assistance, we can continue to help poor children from abuse and provide them educational opportunities, including for the disabled. Our Target Charity: The Fountain Of Life Center in Naklua (2,107,758 baht): Under the auspices of the Good Shepherd Foundation (Registered Charity No. Tor 460/2543), we provide children with documentation, life orientation, education, meals, medical/dental care, and ultimately, scholarships for public schools. 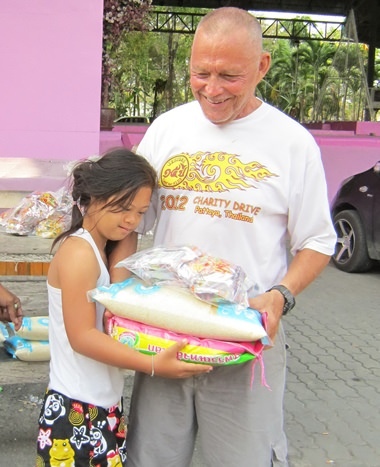 Bill distributing rice and noodles to disabled girl. Next Step Program: We provide children with scholarships to enter public schools, as well as for young adults to attend vocational colleges and universities. * This spring, 29 children from the Fountain of Life Center enrolled in public school: kindergarten-2, primary-15 and secondary-12. * Since 2009, there have been 13 university graduates, including one who completed his Masters in Law. Following in their steps are 5 candidates presently working on their Bachelor degrees and 4 in vocational college. Camillian Home in Lat Krabang (700,000 baht): In a joint venture with the Canadian Jackalope Open (CJO), we provide the 24/7 care for two severely disabled HIV-infected children, and a third child with cerebral palsy. Camillian Social Center in Rayong (27,740 baht): Along with CJO organizers, we sponsor children to go on a Christmas spree at Big C in Rayong. Ban Jing Jai Foundation (610,000 baht): We provide a monthly stipend towards the food costs for 75 orphans plus help furnishing new premises. Share Love With Friends in Nong Prue (337,182 baht): We provide monthly rice distributions to poor families with disabled children, including wheelchairs, walking aids and modifications to motorbikes with sidecars. Khao Baisri Special Education for the Disabled in Sattahip (221,500 baht): We provide monthly stipend for basic necessities and through the Women with a Mission (WWM) provide training teachers for the autistic. Hand To Hand Foundation (250,000 baht): We assisted this care center for marginalized children which was in need to hire more staff. Anti-Trafficking and Child Abused Center (ATCC) in Nong Prue (44,000baht): We provided scholarships for four children to go to public school. Ban Chang Hospital Outreach Program (51,500 baht): We provide assistance to poor children cases, as well as school uniforms and supplies, in cooperation with Pattaya International Ladies Club (PILC). Special Olympics Thailand (SOT) in Pattaya (150,000 baht): We sponsor the Eastern Region Athletics Championship at School #7 for handicapped children competing in track and field, and bocce ball. Kharma Foundation (50,000 baht): In a joint project with Ray Matti, we provide funds to improve quality life of children and their education in the far south and upcountry. Kate’s Project in Nong Prue (15,000 baht): We provide funds for food and donate event shirts for their annual Christmas celebration for the poor families. Take Care Kids Foundation in Pattaya (20,000 baht): We provided funds to help a small boy, who was a burn victim. Chumchonban School in Nong Prue (33,000 baht): We provided eyeglasses for 154 children in cooperation with YWCA. Bannak School in Huay Yai (50,000 baht): In a community project we helped build a new kindergarten with YWCA. Billabong Golf Tournament (7000 baht): We donated to their cause of benefitting Down syndrome children. Children’s Fair event shirts (106,500 baht): We donated 355 event shirts to our project children. Children’s Fair coupons for project children (3000 baht): We provided kids with passes to play games, rides and activities free of cost. YWCA (8500 baht): We sponsor their fund-raiser ‘Run/Walk Event’ for needy children.